In a difficult market that is loaded with unemployed riders, Alex Rasmussen and Jonas Aaen have been forced to step down to continental level. 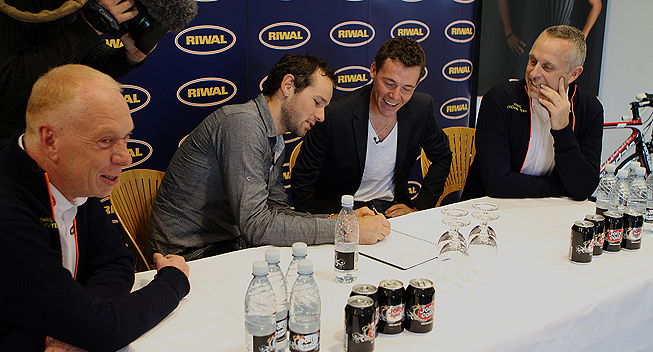 The Danish duo will ride for the continental Riwal team in 2014. With 5 professional teams folding at the end of the season, several riders have been forced to either retire or step down to continental level. Today it was announced that Danes Alex Rasmussen and Jonas Aaen will follow suit as they have signed a contract with the Danish Riwal team for the 2014 season. Rasmussen started his professional career at Team Saxo Bank in 2009 before joining HTC-Highroad for the 2011 season. Having signed a contract with Garmin-Sharp for the 2012 season, the UCI opened a case against him for violations of the whereabouts regulations. He was originally acquitted by the Danish authorities and rode for Garmin-Sharp in the early part of the 2012 season when he even got close to taking the maglia rosa in the Giro d'Italia. The UCI appealed to CAS who overturned the decision and handed him a suspension that expired earlier this year. He returned to competition with Garmin-Sharp in April and won a stage in the Bayern Rundfahrt in a bunch sprint. After what was mostly a disappointing season, he was informed that his contract wasn't renewed and he will now step down to continental level with Riwal. Rasmussen is a former world champion and Olympic medalist on the track and will return to the board in a quest to medal at the 2016 Olympics. His new team has given him the opportunity to combine his track and road ambitions while being a leader in most of the races. "I am looking forward to the 2014 season and we will have a really strong team," he told CyclingQuotes in an interview. "In the next years, I will focus on the 2016 Olympics in Rio with the national track team. I am really happy and motivated by this change. Of course it is a step down so I am looking forward to winning a lot of bike races again. To win it the most important for me." Rasmussen had several offers from higher-level teams but in the end he chose to head back to Denmark. "I had offers from other Danish continental teams and a few Belgian professional continental teams but for me it was important to be a leader every time. I could get that opportunity here. Furthermore, they give me perfect conditions for my track ambitions." While Rasmussen has won 10 professional races, Aaen has been less successful in his 4 years with the Danish Team Saxo-Tinkoff. His only win came at the 2011 GP d'Isbergues and he has mostly been working as a loyal domestique. With the team being forced to downscale a bit due to the loss of co-sponsor Tinkoff Bank, Aaen's contract wasn't renewed. He is now looking forward to getting back to a leadership role with Riwal. "I am really looking forward to riding for Riwal," he told CyclingQuotes. "I was waiting for a response from [Team Saxo-Tinkoff owner] Bjarne [Riis] but when I didn't get any, I had no doubt that I would choose this team. "I am curious to find out whether I am still capable of winning bike races but I think I am. I have been focused on being able to win each race I enter."